I have to say I really enjoyed this story. It’s been a years since I’ve read a western (I’m a long time Louis L’Amour fan) and I couldn’t resist a new western with a twist of horror added to it. The beginning is a little rough and I struggled to figure out what was going on with the main character Drake and his family. It opens at night, the men sitting around the campfire with kids in the wagon, supposedly sleeping. They are attacked by the chupacabra. It is a life changer of the worst kind for our main character Drake. He is horribly burned during the attack and his daughter ends up missing. Once Drake is healed enough to travel he begins the search for his missing daughter. I struggled some after the initial attack by the chupacabra to figure out what Drake was doing. There is a big gap of time missing that I think needed to be added back in. I actually came very close to putting the book down though I’m glad I struggled through because the rest of the story was awesome. Nonstop action and a couple of places that even managed to take this reader by surprise. 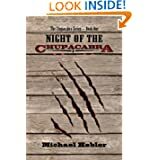 The second I finished this first novel by Michael Hebler I immediately went out and bought the second. I can’t give a writer better praise than that. I’ll hope the second one has a smoother beginning, but other than that I’m hooked. I really wanted to give this story five stars but I had to drop it down because of the confusing first quarter. For those who may feel the same way I did, I encourage you to read through. It’ll be worth it. Posted by Denna Holm on March 7, 2014 in Archives and tagged chilling, chupacabra, cursed, demons, Horror, murder.